Now that you’ve perfected your Moscow Mule recipe (the cocktail that’s taken Wisconsin by storm) let’s turn to The Bluegrass State. Ah, Kentucky. Home of the Derby. Land of the julep. 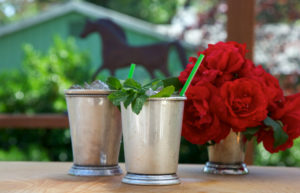 The Kentucky Derby (the popular hat-filled horse race annually in Louisville) did in fact raise the mint julep’s profile, thrusting it onto cocktail menus nationally. 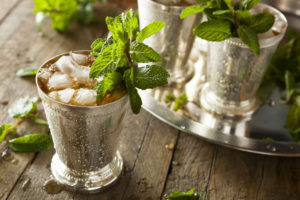 But here’s a bit of boozy history for you: This quintessential American drink actually has its roots in a medicinal Arabic brew called the “julab” — a rosewater and mint blend which was used as a home remedy to treat things like stomach ailments. When Kentucky got into the whiskey game (18th century distillers used the state’s abundant corn crops to produce a corn-based whiskey which later became Bourbon) the ancient Arabic remedy was transformed. Distilleries began producing their unique whiskey in barrels and Kentucky became known as the birthplace of bourbon whiskey. At the first Kentucky Derby, in May of 1875, the clubhouse at Churchill Downs served mint juleps and today the venue sells 120,000 each year during the Kentucky Oaks and Derby weekend. Place the mint leaves in the bottom of an old-fashioned glass and top with the sugar. Muddle these together until the leaves begin to break down. Add a splash of seltzer water, fill the glass ¾ full with crushed ice, and add the bourbon. Top with another splash of seltzer, stir, and garnish with a sprig of mint.